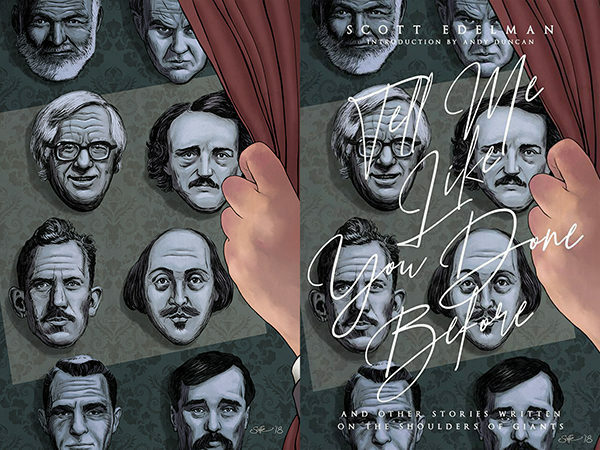 This project involved creating the cover art for a collection of short stories called “Tell Me Like You Done Before” by the American author Scott Edelman, each of which was influenced by a writer such as Poe, Steinbeck, HG Wells, Shakespeare, etc. The editor included the brief which described a hand pulling back a curtain to reveal the heads of those writers mounted on the wall. This project really appealed to me as portraits of literary figures is a favourite subject of mine. The artwork was created with a blend of traditional and digital methods – the faces were sketched out and inked by hand separately, then scanned and combined into the final composition in Photoshop, with colours and textures added that way too.